See more of the Island without the hassle of a car. Four leaflets highlighting some of the best the Island has to offer, all easily accessible by bus. So get on board, enjoy the view from the top deck and check out Beast, Beauty, Birds and Beaches by Bus. 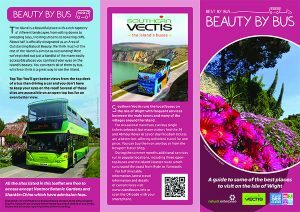 Pick up the leaflets from Tourist Information Points, or from Newport, Ryde and Yarmouth bus stations. Or you can download a copy here. A project of the Island 2000 Trust. © Copyright - Gift To Nature | Designed by Artist Lab.